Following the Australian Grand Prix, there is little surprise that safety around the track is back on the FIA's agenda, though the emphasis is probably not where most people expect. Driver and marshal safety are still important, but spectator safety is paramount, and that is where the FIA are most seriously concerned. 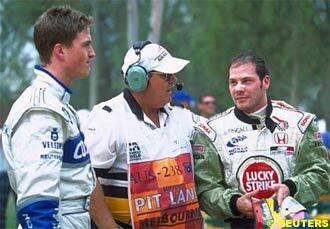 When Jacques Villeneuve contacted Ralf Schumacher, some highly predictable things happened. Given a contact at 170 mph, there was an incredible amount of energy locked up in the wheels, and that had to go somewhere: little surprise the double tethers failed to keep all four on the car, even without considering that the impact could have actually cut some of them. Also, at that speed, bodywork was always going to come off. It's part of the design, and arguably the only reason a number of drivers are alive today. When Martin Brundle cartwheeled his Jordan at Melbourne a few years ago, the disintegration of the car around the survival cell absorbed most of the energy, and allowed him to escape undamaged enough to climb into a spare for the restart. It is possible to design the cars so that most of the components will remain attached after high speed impacts, but there is a major problem with that. There will always be exceptions, whether through fatigue failure, or unexpected types of contact, so there will always be some danger from low flying debris. Furthermore, by enforcing this approach, the task of keeping the driver alive becomes harder, as the designers have to account for even more momentum when considering how to handle the various impacts. So, when considering collateral damage, the FIA has to ensure track designers cater both for low flying cars, and high flying, high energy debris. Regarding the marshal safety question, the changes due for 2003 include some key elements which will permit massive improvements. The introduction of centrally controlled speed limits ("profiles") will allow the FIA to dispense with yellow flags, which is by far the biggest requirement for marshals outside the fence as things stand. Other warning flags are already set to be managed by lights in the cockpit, so existing plans to operate alongside with flag waving marshals can be easily changed. Accordingly, the only requirement for marshals to be on the track will be to attend and clear up after racing incidents. More to the point, the technology for running with lights in the cockpit instead of marshals waving flags could be introduced to the cars as early as May this year: the bigger problem is ensuring the tracks are properly fitted with the equipment to make it happen. So, marshal safety is already being looked at, and set to continue improving to the point where only marshals actively in attendance of a race incident are any less safe than spectators. The spectator safety question is posing more of an issue. Only two things can provide it absolutely: distance, and barriers. Reducing the risk of components coming off cars is a useful third, but is far from absolute. Increasing distances between the track and spectators is already an issue, as viewers resent the increasing size of gravel traps, removing them from the action. Further increasing the space between track and spectators will cause further furore, and even bigger back-lash against ticket prices. Tyre walls are excellent at preventing cars from sliding into the grandstands, but no good for airborne material. All the tracks hosting Formula One events have catch fences in critical areas. Accidents happen, and spectators must be kept safe - and anyway, it often doubles as a useful barrier to keep the crowds away from the track. These offer fairly significant protection to spectators, as they will prevent run of the mill debris from reaching Grandstands. The problem arises, however, when extraordinary accidents take place: Villeneuve's collision with Schumacher is a classic example, as there is currently no way to adequately predict what happens when two irregular objects collide at high speed. Making the fencing stronger, and lifting it higher, would improve spectator safety. Going further, and completing putting a roof on the barrier to enclose the track space would improve safety even more, but there are limits to what can be done both in terms of practicality and cost. So we enter the realm of statistics: if it is possible for spectators to be injured, then what is an acceptable probability? A million to one? A billion? And how can those chances be measured? This is the issue facing the FIA, and so far, practical, cost effective answers are proving impossible to find. Heading up to the Australian Grand Prix, Michael Schumacher's new helmet caused something of a stir, as Bell sued to ensure he wore their product, rather than his new Schuberth model. 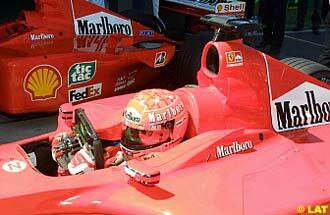 With product placement in sport demonstrably important for marketing purposes, Bell felt obliged to insist via the courts that Schumacher wore their helmet. That the Schuberth helmet was arguably safer did not concern Bell, or the courts. So, why is the Schuberth helmet safer? Well, apart from being made precisely to fit Schumacher's head, or considering the implications of an actual accident, there are three factors. The shape was influenced by the design of the Ferrari cockpit, resulting in reduced head buffeting; the weight was reduced; and allegedly, the cockpit electronics are reflected into the visor, providing a "heads up" display. Reducing buffeting is a significant factor of helmet safety: the more a driver's head moves, the harder it is to see properly. Reducing mass leads directly to significantly lower fatigue over race distances, as the driver does not have to carry the extra mass through high G corners. And a heads up display permits the driver to see what is going on without removing his eyes from the road. However, whilst the FIA are pursuing safety, the real world works on different criteria. The Bell helmet is certainly not unsafe, so no amount of excuses on safety grounds could make a difference to the judge; so at the end of the day, commercial reality was king - and Bell won twice over, with the publicity from the court case bringing additional attention to their helmet over the weekend. Or did they - after all, how many Formula One fans had heard of Schuberth Helme before this race? Heading to Australia, the Prost team was in a bullish mood. The car had performed well in testing, attracting a sponsor to help pay for the expensive Ferrari engine. As much to the point, Jean Alesi had found a measure of the passion and hunger for success that propelled him to Ferrari. Following the low key launch, preparations began for Friday practice, but already plans were going awry - the cars took longer than expected to assemble. The Friday sessions went relatively well: Alesi lost the first session through a broken driveshaft boot, but came out with ninth place for the day. Mazzacane struggled under braking, but the car worked well. Saturday was not a good one. With low fuel, the Prosts proved highly sensitive, with pitch control - the bugbear of 2000 - again raising its head. Setup changes did not work as they had at Barcelona, and the car was a handful to drive. Mazzacane qualified 20th - a full second behind Alesi's fourteenth place. Three seconds off the pace is not what Prost expected. The Ferrari power plant in their car is certainly a useful unit, and it is a pretty open secret that the whole back end of the car is essentially that Ferrari used last year. Testing pace was arguably a fair reflection of the design, and the team really expected to be within a second of Ferrari. Coming away from the weekend, the mood has changed. Everyone believes they have failed to live up to their own promises, and the rest of the paddock is having a laugh - believing the testing performances fall into the standard sponsor attracting category. 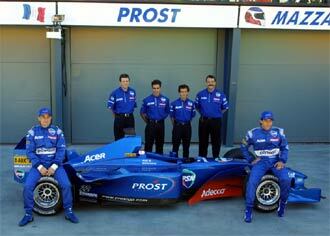 However, the last laugh could be on them: Prost have a problem setting up the car, and they are working on it. Once that has been licked, they will be able to pull out the performance shown in testing - and a second off Ferrari pace would have been good enough for sixth on the grid.